The following is the second part of my email interview with Dr. Allen P. Davis, P.E. the Director of the Maryland Water Resource Research Center at the University of Maryland. Dr. Davis is a leading researcher on bioretention and has published numerous studies quantifying the benefits of its use in urbanized watersheds and low impact development (LID) concepts. In 1993, he received the National Science Foundation Young Investigator Award. 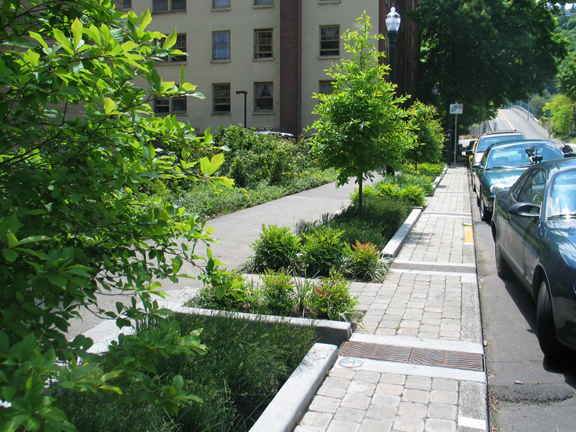 Green Infrastructure Digest: One of the many benefits of bioretention is that it addresses quality of the run-off. How effective are bioretention areas at removing common pollutants (i.e. suspended solids, metals, pathogens, thermal heat gain) and to what extent? 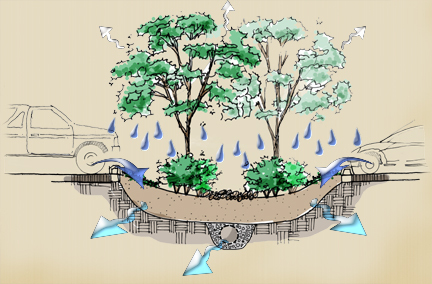 Dr. Allen P. Davis: Bioretention, as with most stormwater practices, addresses water quality through both volume management and pollutant treatment. So first, it is important to reduce runoff volume, which will have an overall beneficial impact on all respective pollutant loads. On the treatment side, we have significant data showing excellent removal of suspended solids and metals. Solids are effectively filtered by the bioretention media. Metals are captured with solids, as some are particulate bound. 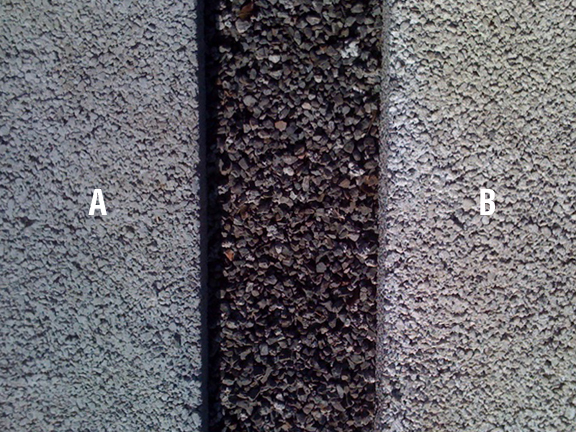 Also, bioretention media has a significant capacity for metals adsorption. Hydrocarbons are adsorbed and we have data indicating that they are readily biodegraded. Research by us and others have shown some removal of pathogens, although pathogen concentrations in runoff vary by many orders of magnitude throughout the year, making quantification difficult. Dr. Bill Hunt at North Carolina State has shown some thermal mitigation through bioretention media. As mentioned above, removal of nitrogen and phosphorus is found, but this is highly variable from site to site and is media dependent. Very low concentrations of phosphorus are targeted for water quality protection. The performance of bioretention for phosphorus will depend on the source and characteristics of the soil used for the bioretention media. Some soils will have relatively high native concentrations of phosphorus. These media will perform poorly and may even export the excess nutrient. Bioretention is probably least effective for nitrate and chloride, both anions. Some nitrate may be taken up by a thick stand of vegetation. In snowy areas, chlorides, as deicing agents, may be applied to roadways and parking lots at very high levels. Chlorides are minimally held by bioretention media and will pass through, though not immediately, to surface and ground waters. GrID: When designing bioretention facilities, what factors have the most impact on their success (i.e. soils, soil depths, slope, plant material, infiltration rates)? Why? Dr. Davis: First, the answer to this question depends on how you define success. We are trying to come up with a good set of performance metrics to define success. Is it to replicate the hydrology, water quality, and habitat of a pre-existing forested area? If so, the bar is set very (unrealistically?) high. I don’t think we’ll be able to completely replicate the forested watershed. Hydrologically, we can attempt to manage volumes and flow rates, and couple these with groundwater and baseflow recharge. We can exploit various physical, chemical, and biological processes for water quality improvement. That said, what we are finding is that design and site factors have different impacts on different performance metrics. For volume and flow management, bigger is better (deeper media, greater surface area), and greater infiltrating surrounding soils will always help. Capture of metals, suspended solids, and some toxic organics varies little with design parameters. They are readily filtered and adsorbed on the surface of the media. Nutrients have very complex fate pathways. We haven’t gotten a full handle on these pollutants and it appears that most of your listed design and site parameters will affect their removal. Dr. Davis: We’re still working against a lot of inertia. 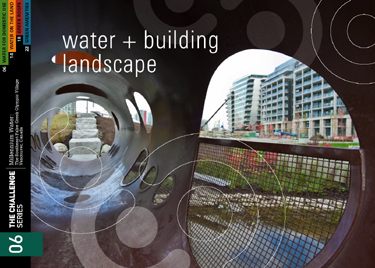 As we continue to install, understand, and learn, green infrastructure will become more prevalent. We continue to need more demonstrations, more performance data. Each implementation will make the next one easier. Regulations and codes need to be updated to allow the inclusion of novel technologies, where we have the science to back it up. As alluded to above, we must understand the fundamentals of how these various green technologies perform. They are not “black boxes” that we can stick a performance number on. Each is a complex combination of an engineered and natural system. We will continue to take advantage of their capabilities, but also look for design and operational modifications to improve performances. We should be able to tailor specific designs and design characteristics to the specific needs of a watershed. The following is an email interview with Dr. Allen P. Davis, P.E. the Director of the Maryland Water Resource Research Center at the University of Maryland. Dr. Davis is a leading researcher on bioretention and has published numerous studies quantifying the benefits of its use in urbanized watersheds and low impact development (LID) concepts. In 1993, he received the National Science Foundation Young Investigator Award. 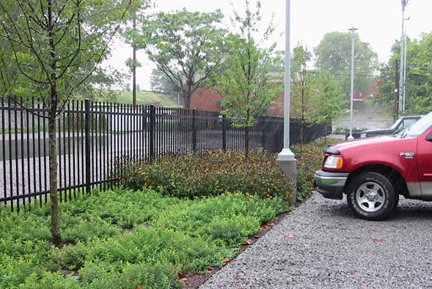 Green Infrastructure Digest (GrID): Over the last 20 years, you and your department have been instrumental in building the current body of knowledge regarding the design and effectiveness of bioretention systems to address stormwater run-off in urban areas. In regard to your current stormwater research, what issues are you and your department studying? Beyond your current projects, what are the issues that you think need to be studied in the coming years? Dr. Allen P. Davis: While we find bioretention to be effective in the management of urban runoff, we still have many unanswered questions and opportunities for improvement. First, we need to be able to quantify performance results. Bioretention systems are all not the same, we should not expect each of them to perform identically, and our (and others) research show that they don’t. Bioretention performance will depend upon the characteristics of the contributing watershed and surrounding soils/hydrogeology, surface area, media depth, placement of underdrains, media characteristics, flow patterns, vegetation, and other factors. As we better understand the fundamentals of bioretention, we can better predict the effects of these parameters, leading to better designs and more effective watershed management. Additionally, we are interested in improving the performance of bioretention in removing nitrogen and phosphorus compounds. These nutrients are the pollutants of primary concern for many water bodies, certainly for us in the Chesapeake Bay watershed. Bioretention performance for these nutrients is marginal and modifications to standard designs are being investigated to improve N and P removal. The list for research topics is very long: what are the fates of captured pollutants? what is the role of biological processes (hydrocarbon degradation, plant uptake, nitrification/denitrification)? what are the best vegetation and vegetation management practices? 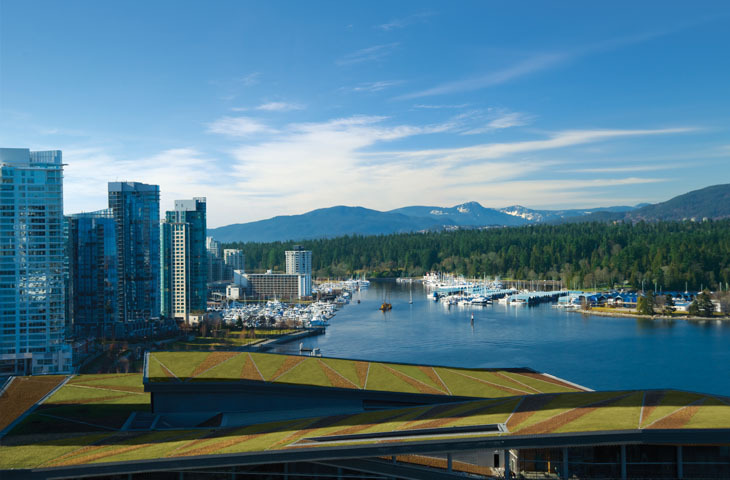 GriD: Over the past few years, green stormwater infrastructure has increasingly been employed within various Cities’ stormwater overflow control plans. 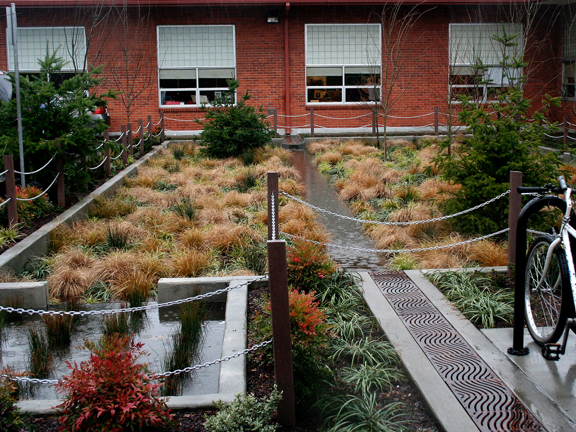 As you know, bioretention is one of the dominant tools within the green infrastructure toolbox. Are bioretention facilities an effective tool for reducing stormwater run-off particularly in CSO events within our urbanized areas? If so, what impact has your research or others been able to demonstrate? If not, why? Dr. Davis: Bioretention clearly can play a role in stormwater volume reduction. The larger the bioretention facility, the greater the reduction. CSOs present a greater challenge than suburban bioretention because of the lack of available land in cities. Some creative thinking can help to improve infiltration and storage in highly urbanized areas, but this is a major challenge. Some cities are looking to expand green space, even through opening up vacant lots for stormwater management. This can be helpful, but must be done on a large scale to show meaningful results.